Posted on March 21, 2011, 9:56 am, by admin, under New Projects, Recent News. Churchill Northern Studies Center, a facility designed to feed and lodge researchers while they conduct northern scientific research, is located 23 km east of Churchill, Manitoba on Hudson Bay. In accordance with their vision “to understand and sustain the North” the new building which should open next month was designed to LEED Gold standards. Clivus Multrum composting toilets contribute to LEED points and allow the facility to significantly reduce water for flushing and allow waste management to be contained neatly within the footprint of the building. In the dormitory area, four waterless toilets and 2 mid-sized composters provide restroom facilities for up to 90,000 uses per year. Twelve flush toilets are also installed in other areas of the building. Composting toilets should prove a big savings for the research station. Last year they spent $25,000 in trucking fees to have sewage moved to a treatment facility. 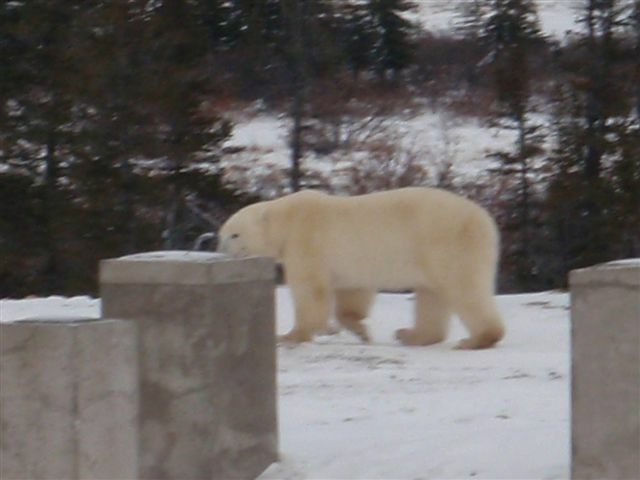 Polar Bear visits were not uncommon on the construction site so a watch dog named Silver was always nearby to give a warning when one stops by. Whenever the big white visitors were present workers found secure lodging until the bear moved on. Posted on January 26, 2011, 12:01 pm, by admin, under Recent News. The Washington Post has a feature on the Chesapeake Bay Foundation’s Philip Merrill Environmental Center in whih the headline of this post appears. The Clivus Multrum composting toilets at the Philip Merrill Center are waterless and allow the nutrients in human excreta to be used as a fertilizer instead of polluting the bay. Here’s a link to the full article at the Washington Post. Posted on October 21, 2010, 11:38 am, by admin, under New Projects. The Products section of Greensource Magazine featured Clivus Multrum Greywater Systems in the September + October 2010 Issue. Clivus Multrum Greywater systems can contribute to LEED WE Credits 1 & 2. Posted on September 16, 2010, 2:19 pm, by admin, under New Projects, Recent News. Musconetcong Watershed Association’s River Resource Center has earned LEED Platinum certification! Clivus Multrum is proud to have played a role in helping the MWA conserve water and reduce infrastructure needs with composting toilets! One medium sized composter and a Foam-flush toilet can accomodate 80 uses a day. Posted on June 18, 2010, 10:16 am, by admin, under Recent News.